The Indian Golden Triangle Trip is the best introduction to India's historic and cultural beauty. The Indian Golden Triangle trip includes the intoxicating cities of Delhi, Agra and Jaipur. The trip is amazing in both ways, whether you travel by road or train. The Golden journey includes the famous as well as UNESCO World Heritage Sites such as Taj Mahal and Agra Fort. The journey starts from Delhi, meet our guide and driver and get back in time as you move through the streets of Old Delhi. Visit the Jama Mosque, spice market and Chandni Chowk. Later, head towards the futuristic New Delhi with vast malls and beautiful buildings. The next stop is Agra. Though the Taj Mahal is the centre of attraction for visitors, other famous buildings are also worth visiting. Situated on the banks of Yamuna River, Taj Mahal looks stunning during sunrise and sunset in a boat ride. Another gem of the city is Agra Fort. Built by Mughal Emperor Akbar, this red sandstone building looks mesmerising. The Indian Golden Triangle trip ends in Jaipur, the capital city of Rajasthan. 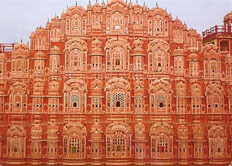 The Pink City reflects the majestic Rajput architecture in its different world-famous buildings. The city also hosts some of the country's best markets. Amer Fort, Hawa Mahal and Amber Fort are some of the monuments in Jaipur attracting thousands of visitors each day into the heart of the state. Head to the Aravalli Hills to get the panoramic view of Nahargarh Fort before ending the trip. The golden triangle trip provides the best insight of the history and culture of the fascinating cities of northern India. This is the private trip and can be customized as per your needs and necessities. This golden triangle including golden temple tour covers the major cities in north India, such as Delhi, Agra, Jaipur with extended Amritsar. Explore the world-famous buildings of northern India in this short yet experience-rich 2-day Agra Jaipur golden triangle trip. Arrive at Delhi and drive to Agra the same day. Explore North India with India By Locals on this 10-Day Golden Triangle Varanasi Tour. This cultural and spiritual tour lets to the famous locations of Agra, Jaipur and Varanasi. Delhi, Agra and Jaipur collectively form the Golden Triangle. These cities are home to many of north Indian famous buildings including the Taj Mahal. Endure the beauty of North India with this 3-Day Agra Jaipur tour from Delhi. This experience packed trip lets you explore the UNESCO sites such as the Taj Mahal, Agra Fort, Jantar Mantar. This 4-day Agra Jaipur golden triangle trip lets you explore the magnificent beauty of UNESCO World Heritage sites, the Taj Mahal and Agra Fort. Learn about the golden period of Mughal Empire.